You know how when you turn your face up into the bright sunlight, even on the coldest winter day, it can totally lift your mood? Well, that’s what our latest limited-edition, seasonal release is all about. The Winter 2015 COLORS edition (our 29th) fulfills our ongoing promise to “try new things.” At first glance, it’s a wintry white-on-white, along the lines of our “Northerly” edition from a few years back, but take “Snowblind” out into the sunlight, and it’s a whole different story. The covers (100# Sappi McCoy Silk cover stock) are silk-screened (a COLORS first in itself) with two custom inks. 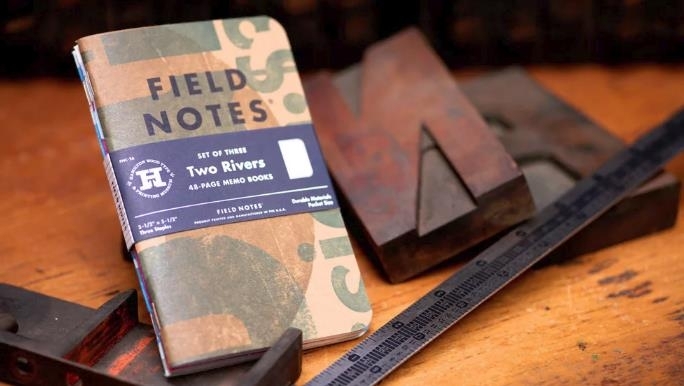 The Field Notes logo is a pearlescent “interference” ink that glimmers and sparkles, and the rest of the book is coated in a nearly-magical “photochromic” ink that changes color when exposed to sunlight. Indoors, they’re white, outdoors they’re blue! The body pages are 60# Finch Opaque text paper marked with a very faint gray graph, and the books are bound with glossy white staples. 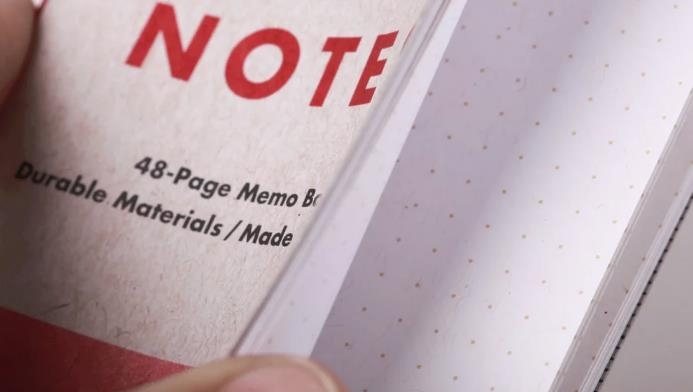 If you want paper that’s one color on one side and another color on the reverse, the simplest thing to do is to start with white paper and print a different ink on each side. We’ve done that, it’s simple, it works well. 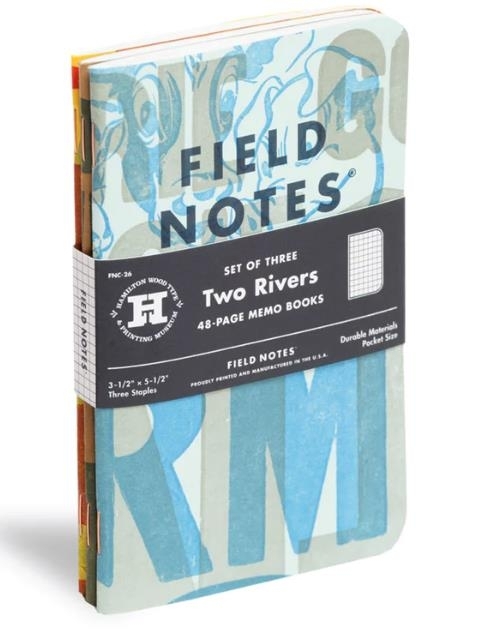 But we’re Field Notes; if there’s a more difficult, expensive, and awesome way to achieve the same result, we will find it. In this case, it’s called duplexing. Using brute force and adhesives, you take two different colored papers and fuse them together so that they become one. We’ve used duplex paper before (in our American Tradesman and Raven’s Wing editions) but this time we had specific paper and colors in mind, and an off-the-shelf solution wouldn’t work. So for the very first time, we made our own. 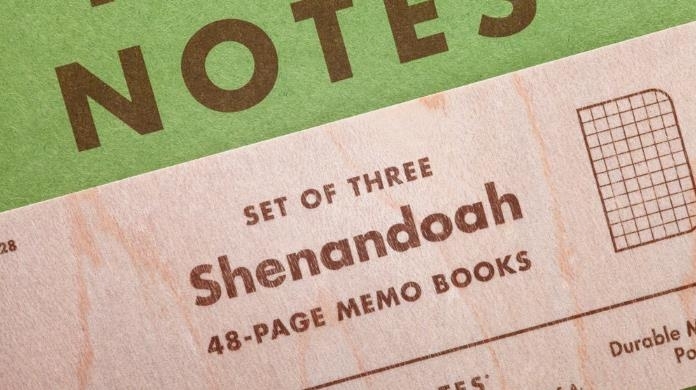 The Shenandoah edition features three green French cover stocks that match the leaf color of three trees found at Shenandoah National Park: the Sweet Birch, the Chestnut Oak, and the Red Maple. Our new friends at Platinum Converting in Itasca, Ill. fused each of the green papers to a contrasting French text-weight paper that matches the tree’s fall foliage. 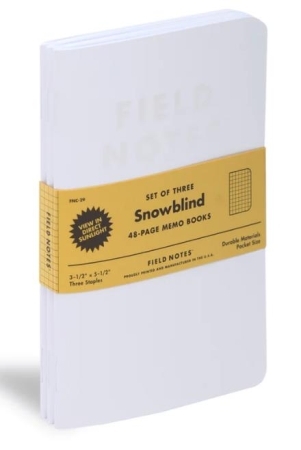 These extra-sturdy duplexed covers have a classic, beefy feel to them, reminiscent of early Quarterly Editions like Mackinaw Autumn and Just Below Zero. 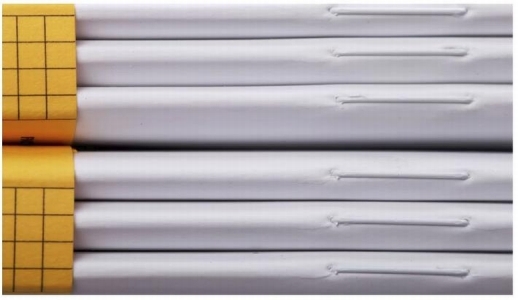 Beefier, actually, since we’ve upgraded our body paper to 60#T Finch Opaque “Bright White,” with a 3/16″ graph. Each features an illustration of a leaf on the back with some facts about the tree. The belly band is real birch veneer, just because it looked so darn good with all that green. The right tool for the job isn’t always drop-forged from chrome vanadium steel or plugged into a 220-volt outlet. Whether you’re rebuilding the engine in a 1967 Pontiac GTO or converting the home office into a nursery, any big project starts with careful planning. 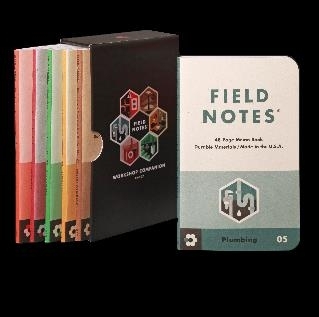 Step away from the power tools and collect your thoughts, specs, and calculations with the new Summer 2015 Field Notes Workshop Companion. This 27th Quarterly Edition is a set of six books, boxed in a sturdy 60-pt custom slipcase with a sheet of crack-and-peel decals. 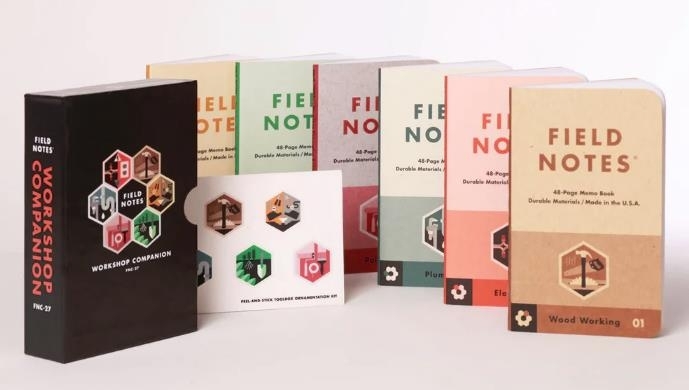 Each of the books focuses on one DIY discipline Wood Working, Automotive, Gardening, Painting, Plumbing, and Electrical — each containing tips, reference materials and the usual Field Notes wise-cracking. 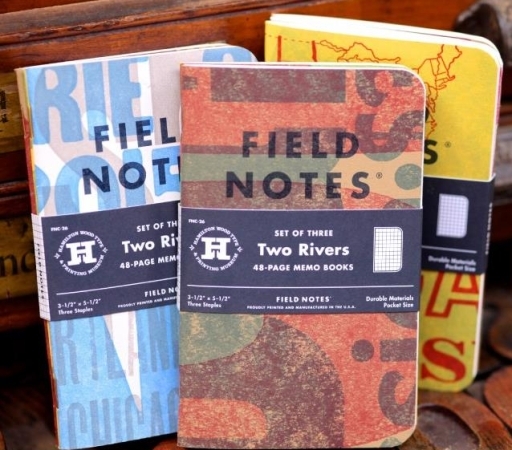 The six covers are color-coded to compliment six tones of 100-lb cover stock from the French Paper Company’s terrific new “Kraft-Tone” paper, their first new grade in five years. 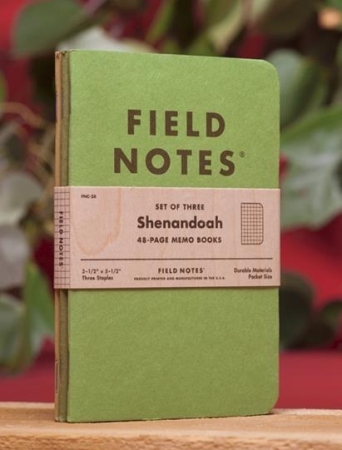 The 70-lb text Kraft-Tone “Standard White Kraft” body pages feature our dot-graph, and are bound with tough brass staples. 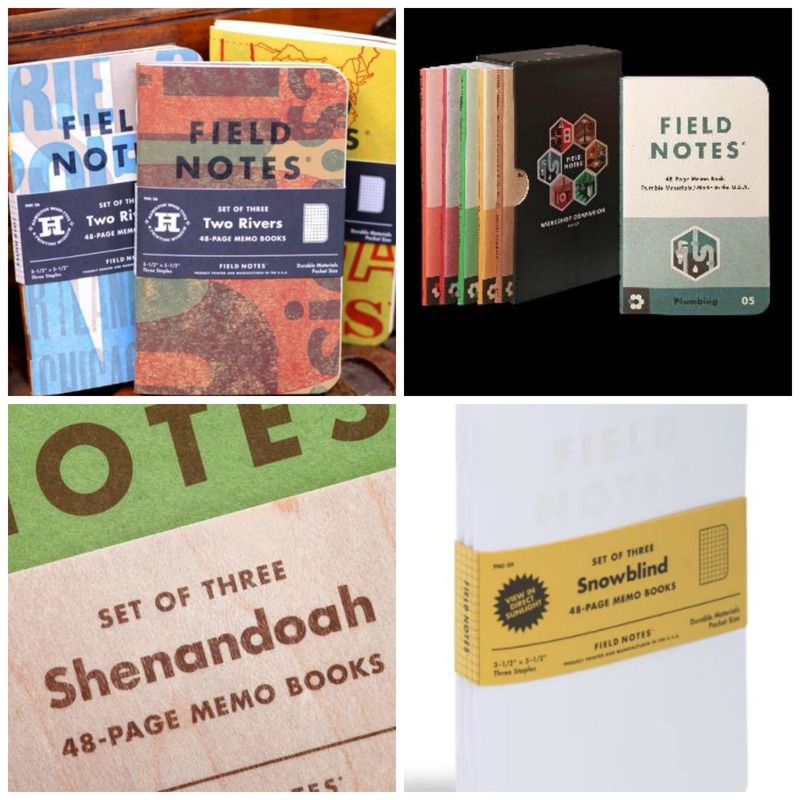 Anyone fixing a switch, planting a bush, or painting a door jamb will find these books make a nice addition to their workbench, junk drawer or toolbox. 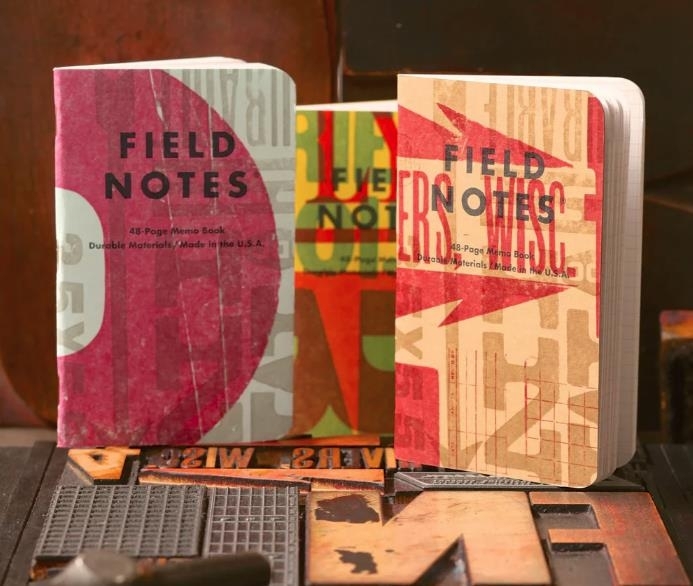 Field Notes loves printing, history, Americana, and a good Wisconsin brandy old-fashioned, so the Hamilton Wood Type & Printing Museum is our kind of place. We reached out to our friends and neighbors at French Paper Co. of Niles, Michigan, who are also big fans of the museum, and they gladly agreed to help. After months of planning and several trips north, our love for the museum and the town grew even greater, and we couldn’t be happier to support their work with our 26th Quarterly Edition. French Paper supplied four cover stocks for these books: Pop-Tone 100#C “Lemon Drop” and “Sno Cone,” Speckletone 100#C “True White,” and Dur-O-Tone 80#C “Packing Brown Wrap.” We hand-set several designs using Hamilton’s collection of vintage type and ornaments. Hamilton then printed our designs in two random colors on a 1961 Heidelberg GT 13″ × 18″ windmill press. Randomizing the designs, papers, and colors resulted in thousands of variations. 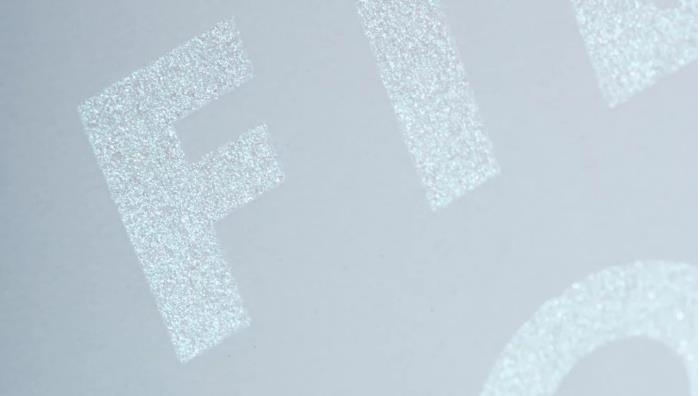 Further variations were introduced thanks to the nature of wood type, letterpress printing, and the music playing in the print shop during the 200+ hours on press. Back in Chicago, our logo and specifications were added with a hit of “Broadside Blue-Black” ink. 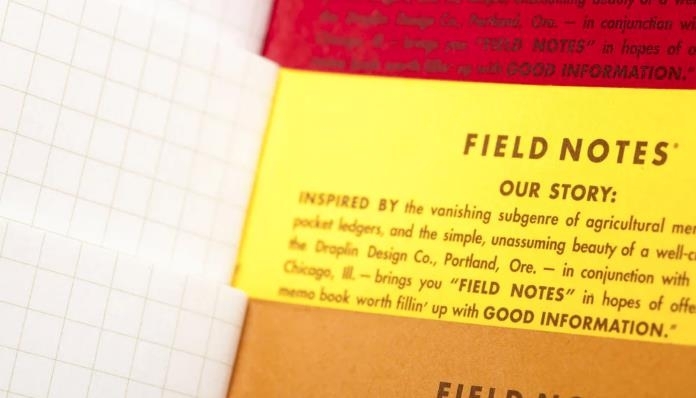 Then the books were bound with 48 pages of Finch Opaque Smooth 50#T featuring our “Double Knee Duck Canvas” graph grid. Three copper staples hold ’em together. As always, they’re all-U.S.A.-made, with a lot of love from the shores of Lake Michigan.